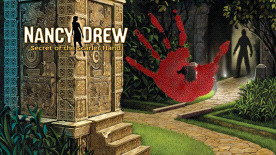 Between cases, Nancy Drew has taken an internship as Deputy Curator at the Beech Hill Museum in Washington, D.C. Nancy soon discovers she will be doing more than learning about ancient Maya artifacts–there have been a series of thefts and the only clue left behind in a mysterious scarlet handprint! Will Nancy be able to put the pieces of this ancient puzzle together? Or will the mystery remain entombed forever? Take on the role of a deputy curator for a prestigious museum. Ride the subway and visit sites around Washington D.C.